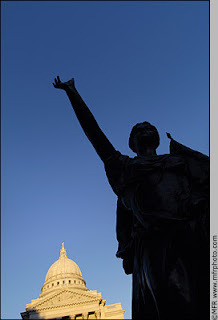 I had lunch last week on Madison’s Capitol square. I looked around at the lush green lawn and the pedestrians ambling past, all of us enjoying the summery day. And I thought: gosh, what a lovely place this is, this city between the lakes. Who would ever want to leave such a bucolic town? Yes, it’s nice to be home. Now I want to show off my other new home: my new web page is now online at www.mfrphoto.com. Please come visit! (We are still working out a few kinks, so if you break anything, please let me know what page you were on and what happened — or failed to happen). My first paid assignment since returning to Madison was a cover story for this week's Isthmus, Madison's weekly newspaper. 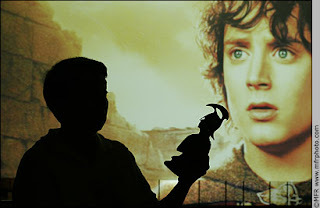 An interview with Kristin Thompson, a film researcher based at UW-Madison. 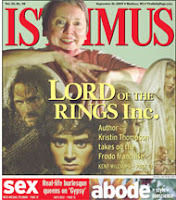 Read the whole Isthmus article here. 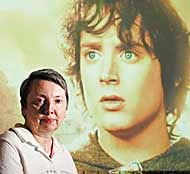 Lighting info: I used a digital projector to shine a LOTR image from my laptop on to the wall behind Thompson, then used an off-camera flash with a tight snoot, at right, to light her. Flash fired by Pocket Wizards. 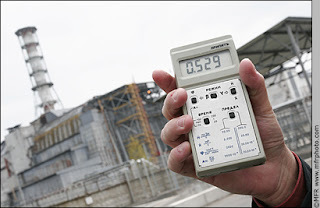 A dosimeter shows the current radiation level outside the Chernobyl Nuclear Power Plant. In the background is Fourth Block of the plant, where the Chernobyl accident occurred on April 26, 1986 during an ill-advised late night safety test. After 21 years, the radiation outside the plant remains high enough that stopping here for more than a brief period is not recommended. Today the Blacksmith Institute released their annual list of the worst polluted places on the planet. It should surprise no one to see Chernobyl on the list. I've been working with Blacksmith to prepare for this news release, and they wanted half a dozen of my photos to accompany the story. In the end, however, they chose a gritty B&W photo of a mutated boy in Belarus as the lead image. People equate radiation with birth defects, but as usual, the truth is a lot more complicated. I've yet to find good statistics on the rates of birth defects around Chernobyl, but they are not as common as you'd believe after seeing such photos. 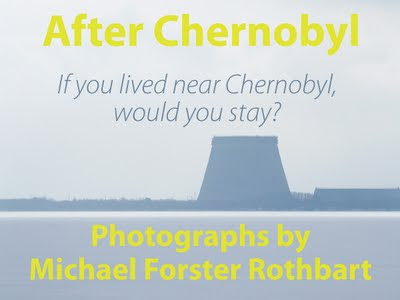 In my 4 months around Chernobyl, I looked for but did not find a single mutant. We've now made it home to Wisconsin, where our yard is full of mosquitoes and our attic full of boxes. Since our return I've been pondering what photo I could post to sum up our experience of life in the former Soviet Union. This is it. It’s a typical scene from Kazakhstan. You walk into the entryway of an apartment building or an office building. The front steps are crumbling, the paint is peeling. It smells like something died in the basement. If there is an elevator, and if it looks like it works, you squeeze through the narrow doorway and the door bangs shut behind you. The interior of the elevator is gloomily lit by a single orange bulb. 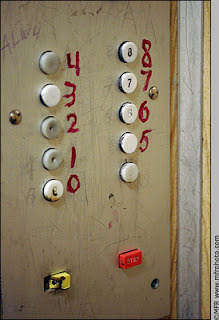 In the half-dark you search for the floor you want, and discover that after five or six decades of grimy fingers, the numbers have long since worn off the white plastic buttons. You take a guess, hit a button and the light gets even dimmer as a motor shudders to life somewhere below. On the way back down you take the stairs. In this case, in an academic office building in Almaty, someone got fed up. I can imagine her, pulling a bottle of fingernail paint out of her purse and hastily scrawling numbers on the wall as the elevator creaks slowly upwards. 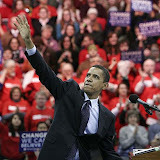 I did not notice the blank button below 5 until later, looking at this photo. Who, I would like to know, works on floor four and a half?